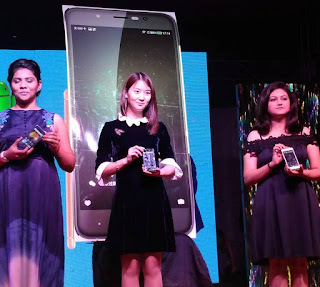 China based, Invens Mobiles, the leading smartphone brand, launches three new smartphones in India on Saturday, 20 January 2018 at Glitz Westend Inn Resort, Mahipal Pur. Invens introduces total of 3 budgeted smartphones: Diamond 2, Fighter 1, and Fighter 2 during the launch event. Along with top executives of Invens, including Mr. Ravi Patel, Mr. Pankaj Dani, and Mr. Nishit Patel, the grand launch event was illuminated with vivacious presence of Mr. Pankaj Mahendru (National President of ICA), Mr. Navin Patel (Chhattisgarh BJP Head), and Mr. Ashish Malhotra (Ex CEO of ZIOX MOBILE). With the stunning look, smart features, and superb performance, these smartphones are purposely developed for the performance-driven generation of the 21st century who keeps a fine balance between personal and professional life and use smartphones to take smart actions. Besides, these all the three models by Invens have preinstalled women safety applications that keep them protected from stalkers, cyberbullies, etc. Moreover, Invens offers 2-years warranty, free replacement for any damaged part and instant repair or replace policy not only to be used under warranty but are also for out of warranty service. Invens mobile also provides one time accidental warranty on each damaged part. The budget price tag of these models are, Diamond 2 at INR 7490, while Fighter 1 and Fighter 2 are priced at INR 8990 and 11490, respectively. Invens is the registered trademark of Shenzhen Bopel Mobile Technology Co, which is a specialized manufacturer of smartphones, and has a proven presence in countries like Dubai, Africa, Indonesia, Thailand, Philippines, Burma, Egypt, Brazil, and Bangladesh. Shenzhen Bopel Mobile Technology Co made debut in India in 2010 with a very successful brand -Kimfly. Now, after studying and manifesting the market for almost 7 years, it is interested to expand the presence in Indian mobile market with some disruptive models. The company is determined to make pan India presence with these scintillating models in the next six months and is ready to invest INR 500 crores in 2018 as per its expansion plan. The sales department of Invens is committed to achieving a target of selling more than 1 lac units in the present quarter. While addressing the media, Mr. Pankaj Dani, Founder & Director of Invens said, “We are launching these phones after making rigorous research on the needs and wants of today’s consumers. These are smart, sturdy, and user-friendly smartphones with all the latest features and configurations. Despite having the features of hi-end smartphones, their prices are not just competitive but affordable too”.